On Wed, May 13th Cher noticed that Garrett wasn't moving around as much as he had been in the past. Garrett has typically had 2 - 3 sessions of rolling, elbowing, kneeing, kicking and otherwise jumping around a day, but on Wed was not as active in his normally rambunctious morning session. We visited the Dr that day for our weekly visit and were able to hear that Garrett's heartbeat was running in the normal range, around 150 beats/minute. The Dr couldn't explain the decrease in activity but indicated that we should pay close attention and look for around 10 movements within 2 hours during Garrett's awake times. He said that it wasn't uncommon for unborn babies to just have one fairly active session and that would be in the evening. So on Thurs we paid close attention, and again didn't observe as much movement as in the past. Friday morning we didn't feel any movement and decided to visit the Dr. At first we used the Doppler, and couldn't hear a heartbeat. Then we used the ultrasound and were not able to see a heartbeat either. At that point Cher and I were both crushed. Cher had carried Garrett for 38 weeks and we were so sure that God was going to grant our wishes this time and allow us to have our child. Garrett is now with his sister Caitlyn in heaven. Honestly, Cher and I are still struggling with why we've had to endure these challenges, and why we've lost 3 children now. There are no medical explanations as to why we've had 3 different "situations" where we've lost a child. Each situation has its own unique set of circumstances, and while we understand what happened in each case, we are being told that there is no commonality between the 3, and each one is a "fluke". All we know is that we've conceived 3 children now, and that each of them has left us to live with God. Cher and I have said to each other several times "Parents aren't supposed to bury their children. It's supposed to be the other way around." This last pregnancy has been a real roller coaster of emotions. From the joy of discovering that we were pregnant, to the sorrowful news that he would have Trisomy 18 (Edward's Syndrome), to the glimmer of hope that maybe this time things could work out after carrying Garrett almost full term, we've run the entire gamut. We were told that Trisomy 18 babies typically don't make it to delivery, and those that do don't survive very long afterwards. Contrary to what we read and what the Drs told us, we maintained the faith and belief that God could and would deliver Garrett to us, and allow him to live out his life. Apparently this is not God's will. On that Friday when we discovered that Garrett wouldn't be joining us, we we were very confused and angry with God. Cher had some words with Him, and I couldn't bring myself to talk to God. Later that day I asked a friend if he could pray on our behalf, because I wasn't ready to talk to God yet. Later that day, we admitted Cher to Northside Hospital. We were blessed to have several friends, my parents, and Cher's Mom and sister with us. Everybody was very supportive and praying on our behalf for a quick and safe resolution to this situation. Around 4pm the Dr. gave Cher petosin to induce labor. The petosin kicked in pretty quickly and pretty soon Cher was experiencing light contractions about once per minute. We were also fortunate enough to get a visit from a wonderful nurse that had helped us through delivering Caitlyn. Her name is Kathy Sanford. It was good to see a familiar face. That evening Cher thought her water had broken, but we discovered that she was bleeding pretty heavily. The Dr indicated that the placenta was too close to the cervix and that the expansion of the cervix was causing the placenta to tear away. The Dr indicated that we needed an emergency c-section and that there was a possibility that Cher could hemorage and bleed out. Also, since she had lost a lot of blood, they could not give her the epidural. I was scared to death at the possibility of losing Cher, but tried to maintain composure in order to deal with the situation. Also, still being angry with God over losing Garrett, it was hard to turn to him regarding Cher's surgery. After losing Garrett, I was now faced with the potential to lose Cher too. At 11:25 Cher was taken into surgery. We were told that the procedure was complicated because of the proximity of the placenta to the cervix and that the procedure would take about an hour. Shortly after taking Cher back to surgery, the nurse returned to ask what should be done with Garrett. In the midst of facing losing Cher, I was now being asked what I wanted to be done with Garrett. Luckily Kelly was so supportive and reminded me that Cher had not had the chance to experience certain things with Caitlyn and that I needed to wait until Cher was out of surgery and awake before we saw, dressed and measured Garrett. I asked the nurse to hold Garrett until both Cher and I were available to see him. God was watching over Cher and about 20 minutes after taking Cher back, the nurse returned to indicate that the procedure was finished and they were closing Cher up. The surgery had gone very smoothly and Cher was going to be fine. Unfortunately, though, Cher would be in a good bit of pain for the first few hours after the surgery. That was the understatement of the century. For the next several hours, several of us stood by Cher, fanning her to make her more comfortable, rubbing her feet, and trying to talk to her to encourage her and keep her mind off of the pain. It was brutal to watch Cher laying there moaning from the pain!! We prayed over Cher for healing and for God to remove the pain for the next several hours. Around 2pm that morning Cher was finally to a point where she wasn't in constant pain and could relax and eventually go to sleep. The nurse indicated that if someone not in Cher's situation had even a 10th of the drugs that Cher was being given, they would be knocked out cold. Around that time, the nurse again asked me what should be done with Garrett. She had not yet taken him down to the morgue and wanted to know if I would like to see him. I did want to see him, and also allow everyone that had been through everything along with me to see him, so I asked if he could be brought out. The nurse brought him out to us wrapped in a blanket. He was the most beautiful baby I had ever seen. He had a full head of hair, and only the slightest evidence of the Trisomy 18 syndrome. He was missing both thumbs and his hands were turned inward due to the missing radial bones in both forearms, but he was perfect in my sight. Even thought Cher had just been able to fall asleep after all her pain, I knew she had to see him. I carried Garrett back down to Cher and placed him in her arms. She was literally "glowing" when she saw how beautiful little Garrett was. She immediately noticed that Garrett had her cute little button nose. We also discovered that he had very big feet. After everyone had held him and we took tons of pictures, most everyone left, and Cher and I settled in for a few hours of sleep. The next morning when we woke, the nurse came in and we weighed, measured and dressed Garrett. He weighed 4 lbs, 12 ounces and measured 17 inches from head to toe. We are guessing that he stopped growing about the 34th week, due to the Trisomy 18 syndrome. 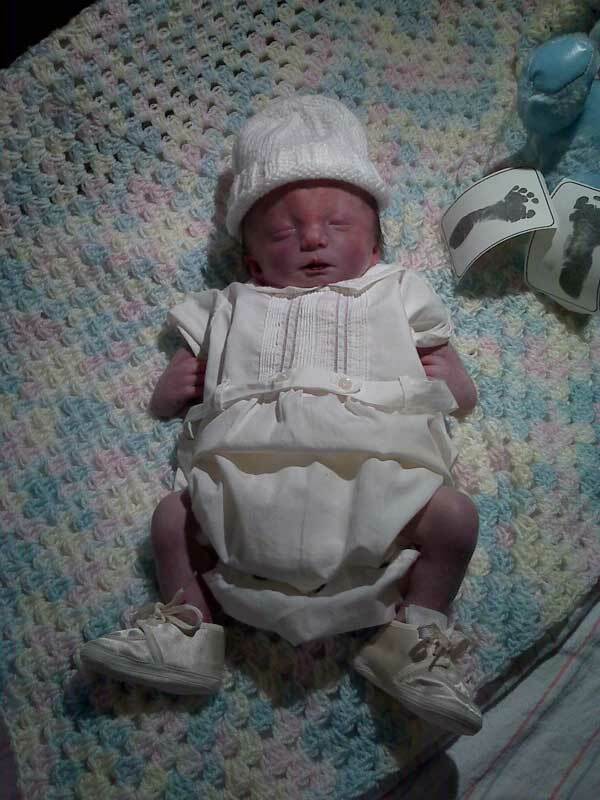 My Mom had brought the Christening outfit and shoes that I had worn as a baby, and we put them on Garrett. He was such a handsome little guy. Cher was still feeling some pain, but the nurse told her that she needed to start moving more and should be sitting up and even standing on her own within 12 hours of the surgery. At about the 16 hour mark, after our "assigned" nurse let us sleep for several hours that day, we got a visit from Kathy who motivated Cher to get up and going. At that point, Cher was a real trooper and rolled from her back to her side, and soon after that was sitting up on the bed. I could tell that Cher was still in considerable pain, but she was working through it. Later that day, Cher took the short walk to a wheelchair, and we moved upstairs to a new room. Our new nurses informed us that within 2-3 days of the surgery, Cher should be ready to check out. As Cher was still in considerable pain, we weren't too sure of the nurse's claims. Just as the nurse had promised, though, after the light activity of moving to the new room, and the first visit to the rest room on her own, Cher was feeling 100% better. After that Cher continued to improve very quickly and is now up and walking the halls. We've had many visits from friends and constant reminders of how many people were praying for us throughout our ordeals. Regardless of the confusion and anger that we've held against God, He has continued to comfort us and provide for us through skills of the doctors, compassion of the nurses, and the love and comfort of our friends. Cher is doing so well that we probably could have checked out today, and had a nurse visit us tomorrow at home to take out the staples. I wanted Cher to stay here in the hospital though, until the staples were removed, so we'll be checking out tomorrow morning. Today I visited Patterson's Funeral home to arrange for Garrett's cremation. We will be having a memorial service at 11AM on Tues, May 20th at Mount Paran North. Our love and thanks go out to Whitney Till for coordinating and arranging this service for us. We are having an open casket viewing before the service and afterwards, Garrett will be cremated. Throughout this ordeal, our faith has been extremely challenged by our circumstances, but God has never left our side, even when we didn't want to speak with Him. Although we still don't understand the "why", we know that everything that has happened has been part of His overall plan. We know that He has guided the surgeon's hands to rescue Cher from a dangerous physical condition, He has surrounded us with friends and family to support and comfort us, He has given us the strength and resolution to overcome our challenges, and He has spared Garrett from living a life of challenges and complications caused by Edwards Syndrome. Even though we are extremely sad about losing Garrett, we know that he is now in a better place, and that his time here on earth is somehow part of God's perfect plan for all of us. We plan to continue trying to have a child, and believe that God will one day bless us with a little boy or girl, or both. I am so very sorry for your loss of your angel Garrett. I too, lost a baby at 37 weeks last July to Trisomy 18.I knew at 20 weeks and decided to carry for as long as God allowed me to be with our angel. I wish I would have known of your situation before now. I know exactly what you are going through and the love and hope that you had for your little one. I would love to connect with you and help you through this. I needed support (need it still) and my husband and I go to Mt Paran as well. Please email me at tracy.kimble@gmail.com. My prayers are with you as you mourn the loss of your little one. Just know that right now God is holding you in His arms.